With tomato season officially underway, we're going to have to make some hard decisions. Like --- now that our happy plants reach over my head, do I keep tying them up and harvest with a stepladder or do I let the plants hang down? Or, how about this --- do we plan ahead for a future blight year and can some tomatoes as well as freezing them? And --- what do I do with that first roma when it doesn't have enough sisters to make into sauce? This week's lunchtime series doesn't actually answer any of those questions, but it does explore some of the cosmetic problems you might run into while wandering through your tomato patch. I mentioned in an earlier comment that orange tomatoes are caused by high heat, and the truth is that tomatoes will complain about lots of environmental variations in several different ways. I subscribe to the "eat it or give it to the chickens" school of thought, so discussing vegetable cosmetics is out of the ordinary. 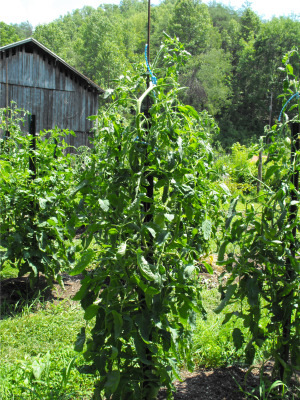 But I recently realized that beginning gardeners might not know the difference between pissy tomato plants upset by two days without adequate water and blighted tomatoes that are going to wipe out your entire tomato garden. If that describes you, stay tuned for a look at all of the tomato problems that aren't contagious and can simply be cut out of the ripe fruit.